I was lucky enough to receive The Rose Muddle Mysteries: The Amber Pendant by Imogen White as a random prizewinner. A re-tweet of Sara Grant promoting Undiscovered Voices for SCBWI-BI – and it came in the post. Always exciting to get a real paper book! 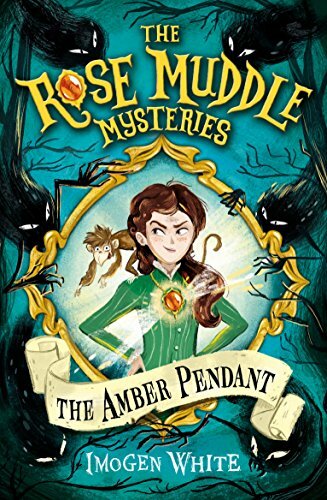 I wanted to read The Rose Muddle Mysteries: The Amber Pendant in its own right – and as an Undiscovered Voices winner in 2014. What could I learn from it? Here are some conclusions – which focus on what works and why. The illustrations on the cover and inside are by Davide Ortu. Their bold, cartoon-like quality, together with a degree of sinister and subtle shading, suggests a book for older children rather than teens. The quirkiness in the lettering hints at humour. Both promises are agreeably fulfilled. What you can’t see in the image above is the shiny glaze on the pendant – and in the eyes of the creeplings. Usborne’s production values make this an attractive book – and in our strongly visual culture, this feels right. Even without the sheen around her, you still get a fine sense of Rose as a bold girl slap-bang in the middle of the action.She’s brave, a bit cheeky – and central to the adventure. Historical mysteries are in vogue at the moment – see Robin Stevens’ Murder Most Unladylike series or Katherine Woodfine’s Edwardian Sinclair’s Mysteries. The unusual aspect of Rose Muddle’s story is the magical element – a touch of Susan Cooper and of Wilkie Collins. The monkey in the picture, Bahula, is also significant. He plays a key role in the plot – and Imogen White uses Rose’s changing reactions to him to reveal character development. This is economical and effective. Including animals seems like a smart idea. Period details are linked to common (ish) experiences to ease readers into a different world – for example smell of toffee apples in the Pleasure Garden. Tiny little episodes like Rose remarking on a lamplighter passing by are used too – again with double purpose. Not just a reminder of 19th century Hove but a swift way for showing time passing. Neat. Historical and fantasy books do tend to be longer due to the scene setting. This one is 329 pages with 46 short chapters. Maps and images of key characters help the reader too – and in some cases, matters are spelled out. Her eyes flashed at him. She just wanted his reassurance. This is a reminder to me to judge carefully when to show and when to tell. Young readers are smart – but not experienced. I do recall being frustrated by books that assumed I understood when I didn’t. Little things like italics for first person thoughts do help. When a strand that had gone off-stage reappears, there’s a little re-iteration (often through dialogue). Likewise the narrator voice is used to signal the change from one character’s point of view to another. Minor characters in particular get visual labels (for example a monocle) to help the reader keep tag. Major ones with speaking parts get repeated phrases. The delightful Rui has a delicious and amusing turn of phrase in particular. ‘Elephas Maximus!’ is his expression of surprise or wonder. I should bear all this in mind when using a large cast. The presence of an unseen malevolent observer in one scene reinforces the usefulness of third person. There’s something of a pantomime ‘She’s behind you!’ moment for the reader – which can’t be done in a purely first person narrative. Ideal for a mystery – especially one with a sense of humour. I am heartened that such a blend of history and fantasy has been published. Its convincing sense of a real place in a specific time period combined with myth and legend delights me. It gives me many pointers for my work ( even more than I’ve covered here). It also gives me hope. This entry was posted in Inspirations, Reading, Review and tagged reading, review, reviews, writer, writing by KMLockwood. Bookmark the permalink. Fascinating reading. I’ve never read a review with a writer’s perspective before. Really enjoyed it. And you’ve sold the book to me. You sweetheart. I’m sure Imogen White will be pleased about that. Lovely Philippa! I saved this, now playing catch-up. A beautifully written perspective on another book to add to my TBR pile.